Readers are in for a treat as they uncover the gripping pages of Gunplay: Beauty Redeemed. In this exciting and groundbreaking fiction, written by William David, readers will be taken to a world where the latest medical technology stirs Phoenix, Arizona by storm as the cure for “intellectual disability”, also commonly known as mental retardation, finds its way into the market. A brilliant and talented neurosurgeon, Dr. Arthur Anderson engineers an innovative and cutting-edge device that can repair the brains of the cognitively disabled. This invention allows for them to live normally. It is patented and named Server One. Ever the humanitarian, Dr. Anderson makes his creation available to the public, until a money-hungry and greedy Oscar Smith comes along. Scheming, cunning and cold-hearted Smith tries to take over the business through his trademark treacherous and shrewd ways. In an advanced world of computers, gossip can spread fast like wild fire. Indeed, a nasty, conspired rumor leads to the destruction of Dr. Anderson’s reputation. Now he seeks to find a way to redeem himself at all costs, even to the brink of using violent measures as the legalization of carrying firearms has consumed the very citizens of Phoenix, Arizona. Filled with fascinating and interesting characters blended with the highly-embellished social setting, this story is definitely going to exhilarate its readers. Riveting, Gunplay: Beauty Redeemed takes one away from the 2010 that everyone knew and into an alternate world where carrying guns have become the latest fashion statement and blogging has become a tormenting tool that overwhelmingly ruins people hard-earned careers, business, family, reputation and lives. This book will be featured in the 2011 Book Expo America Book Exhibit in New York, NY, which will run May 23-26, 2011. 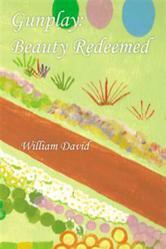 William David is a novel writer and a novice painter. A romantic, the author also wrote Betti’s Blog: Beyond Beauty Redeemed as a novel poetry book companion to Gunplay: Beauty Redeemed.